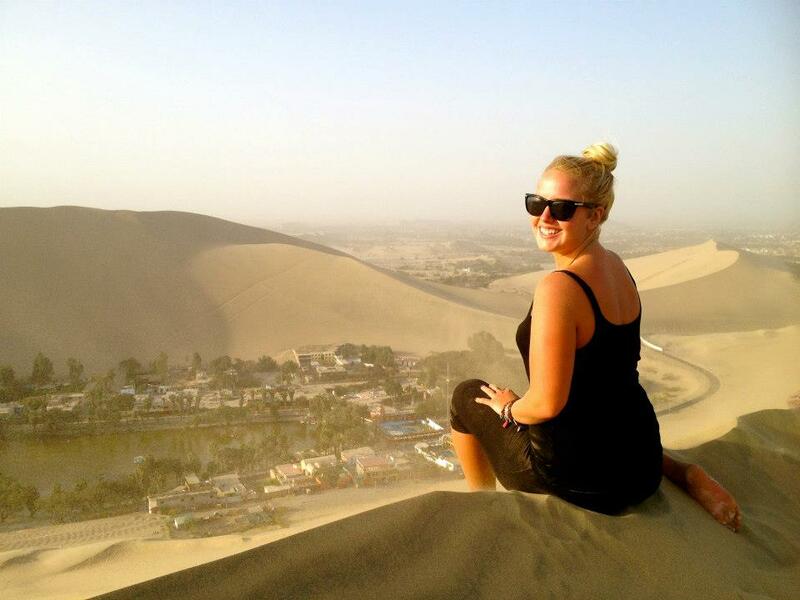 Huacachina, Peru… I Love You! Huacachina is a small haven built around a tiny, man-made lake in the middle of the desert. As soon as I saw it I fell in love and instantly decided I’d spend a few days there. It is the most beautiful, incredible place. Huacachina is literally a town made purely for backpackers and travellers so it’s just full of Hostels, Restaurants and Rastafarians selling jewelry and playing music. It’s pretty much a hippy haven in the middle of the desert and I loved it! My first afternoon there I decided to walk up a massive sand dune behind the hostel to watch the sunset and I’ll tell you now, walking up a sand dune is much harder than it looks. We were literally walking up on our hands and knees, heads bowed down to avoid getting the sand, swirling around from the wind, in our eyes. It was a hard workout for sure but the view was absolutely spectacular. It looked as if the desert went on forever. 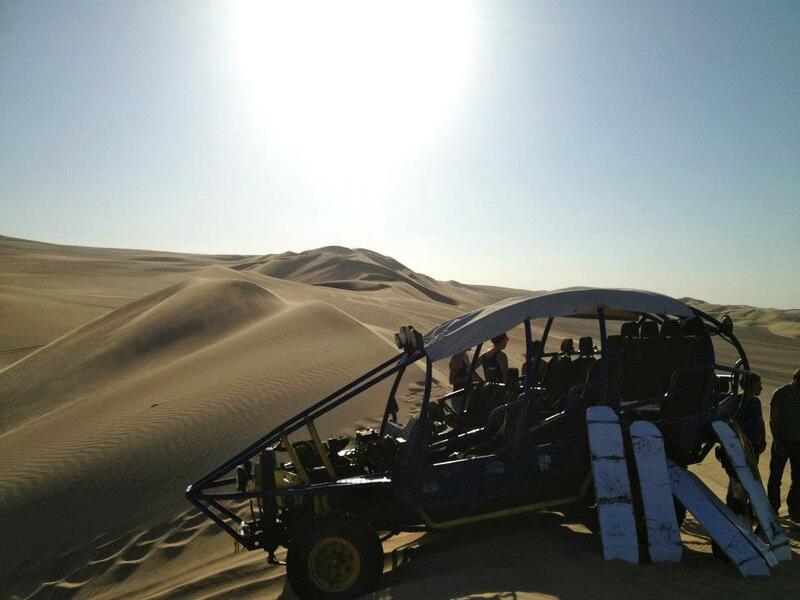 This was my favourite activity in Huacachina, so I highly recommend it. You can organise these afternoon sunset tours through the hostel you are staying at for a decent price. Little buggies pick you up from your hostel, then drive at fast speeds over the huge sand dunes. It is so much fun, it feels like you are on a roller coaster, bouncing along in your seat. 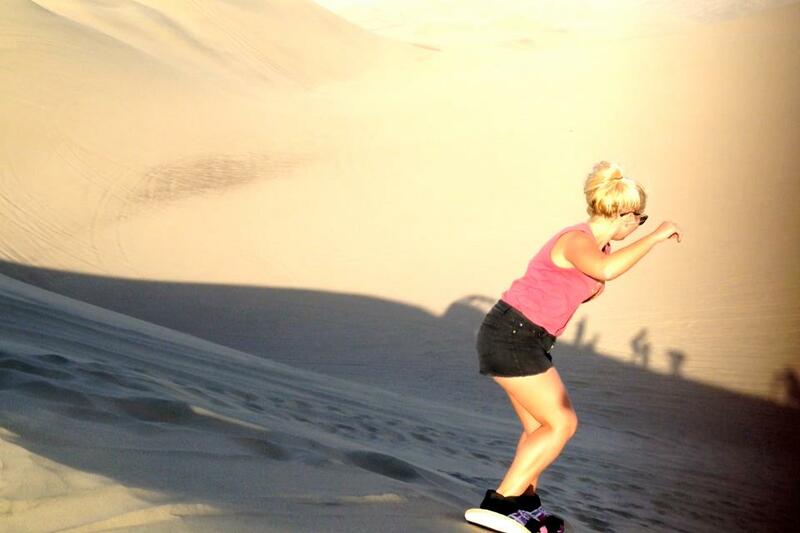 The drivers know the desert well and stop at specific dunes throughout the tour where you can go sand boarding. On some dunes you’d go down on your belly, sitting down or standing up like you were snowboarding. 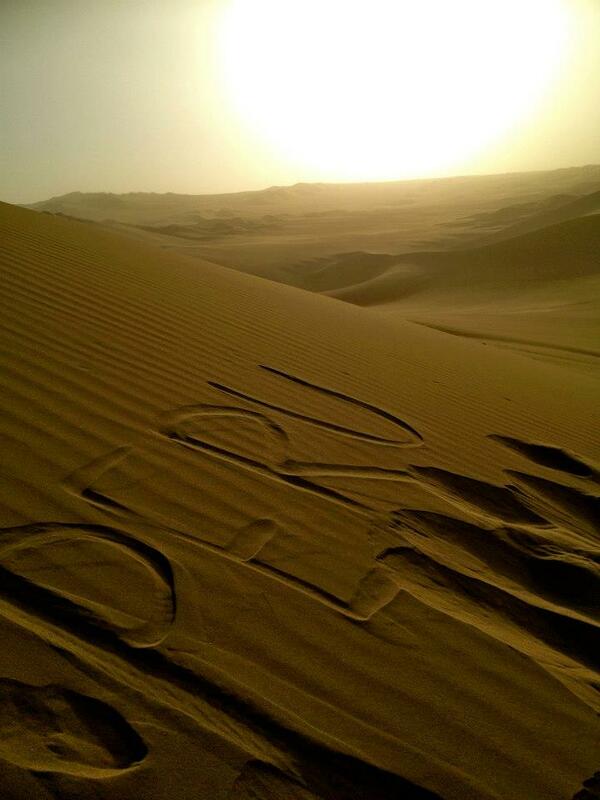 It was SO much fun… and the views of the sunset over the never-ending desert were incredible! The weather always seems to be nice in Huacachina, so it’s a perfect place to lie around in the sun, read a good book or hire a paddle boat to take out on the lake. There is always a few Rastas sitting around with jewellery and other pieces for sale at cheap prices. I always like to buy bracelets from my travels and one of my all time favourites came from here, so be sure to check out the ‘markets.’ The Rastas also tend to wander around town busking and playing beautiful tunes which just adds to the ambience. I stayed at the ‘Desert Nights – Hostelling International.‘ I really liked this hostel, all the staff spoke English and were super friendly, the rooms were clean (as clean as can be, being in a desert with sand everywhere) and the restaurant/bar seemed to be the most popular in town, which was great when you were tired and didn’t want to venture far. It also was decent priced. There are a bunch of other hostels and hotels around the lake as well, if you wanted to book upon arrival. I look back at Huacachina with such fond memories, it’s such a beautiful backpacker oasis that you should definitely visit during your time in Peru! Would you visit Huacachina? If you have what did you think? Love it or hate it? Let me know in the comments below! Salento, Colombia – A Real Life Cowboy Town! The Gringo Trail of Colombia – What To See And Do!